For accurate control and navigation of an autonomous underwater vehicle (AUV) it is critical to know the water current velocities around the vehicle body. The AUV-onboard acoustic doppler current profilers are unable to measure the current near to the vehicle due to their blanking distance, so an AUV model-based observer can serve the purpose of estimating the current velocities surrounding the vehicle. In this paper, a high-gain observer based on an AUV dynamics model was used to estimate 3D water current velocities. The water current velocities were determined by calculating the differences between the vehicle velocities over the ground measured by a Doppler velocity log-aided inertial navigation system and the vehicle velocities through the water estimated by the model-based observer. Modeling and field trials of a Gavia AUV were used to demonstrate the approach. Instead of deriving the roll, pitch, and yaw motions, these were directly given as simulation inputs which allowed the AUV dynamics model to be simplified to 3-degrees of freedom. This paper presents a real-time model identification algorithm to identify the nonlinear parameters of the AUV model by utilizing a recursive least squares method. The real time model identification algorithm allows the AUV model to be continuously updated in response to the operational environment. A high-gain observer was chosen as a nonlinear estimation algorithm to obtain the vehicle velocities through the water, and the Lyapunov stability of the estimation error dynamics was investigated. The observer gain was computed by solving the linear matrix inequality which represented the error dynamics. 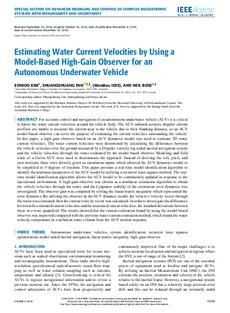 By utilizing the observer in the AUV dynamic model, the vehicle's velocity vector through the water was estimated, then the current velocity vector was calculated. In order to investigate the differences between the estimated current velocities and the measured current velocities, the standard deviations between these two were quantified. The results showed that the current estimation found by using the model-based observer was improved compared with the previous water current estimation method, which found the water velocity components in a turbulent water column from the AUV motion response.